New pages will update every Monday! And now I am funding the comic through Patreon! You do not have to donate to read the comic. You do not have to feel guilty for not donating! But if you want to donate, you can pledge as little as $1 per month and get a variety of goodies, ranging from sneak peeks ahead and the ability to vote on upcoming side comics, to books and other swag at higher donation levels. »» GO TO PATREON FOR ALL THE INFO! Or read the comic. That’s great too! I will be announcing page updates here and also on the Kismetcity Tumblr. In the run-up to restarting Kismet: Sun-Cutter on Sept. 1, I've created a Kismet tumblr and have been posting character bios and bits of information to it. Most of this is getting reblogged over to my regular tumblr as well. Here's what I have thus far. For my own reference - characters who still need bios, and things I want to write mini-articles on, like the two above. Anything else you're curious about? What sort of information might intrigue you enough to check out a new-to-you webcomic? "Hunter's Moon" is up on my website! Linux shell scripting, on the other hand, is awesome. Once I got my page template and CSS in nice working order, the entire 340-page archive was generated using a single while loop (in batches, so that I could swap out different SSI menus). The Mac has tools to do a batch filename find-replace! How did I never know this before? I've wanted to get the HM archive on my own domain for a long time, and now it's there -- ad-free, bare-bones, safe and permanent as long as I pay my web hosting bill. I don't know how to do a lot of fancy pro-quality things with HTML, and my general website design aesthetic is still stuck in 2002 -- but I can do basic functional web design and I'm pretty happy with it. Portal page for the Kismet graphic novels. Locally hosted Sun-Cutter archive (probably based on the HM page template, except with a white background). Finish getting Sun-Cutter up on Tumblr. Downloadable versions of Hunter's Moon (PDF and HTML). I hate to do this, but I'm going to have to drop back to a 1-page-a-week schedule for Sun-Cutter for now. It's spring, mostly, that's done it -- I'm spending a lot of time outside, working on all of the spring projects that had been deferred all winter, and I've already run through most of my backlog of pages without replacing them nearly as quickly as I'm posting them. I think I can keep up with a weekly schedule easily, and I hope I'll be able to resume the twice-weekly updates later in the year (if only because it'll get me through the story twice as quickly, and I'm really looking forward to getting to some of the future stuff! ;p). So the next update will post next Monday rather than this upcoming Thursday. Kismet book: pay for download? I'd like to start having more interesting, non-comics content on this blog, so here is a question for you. Since attempts to publish a "Hunter's Moon" book via traditional publishing keep falling through, I'm going to stop procrastinating this year (REALLY, I MEAN IT THIS TIME) and put together a downloadable version (probably also with a POD print version through Lulu.com or someplace like that). The whole comic is available online for free anyway, but I think a nice downloadable PDF or HTML archive (or both) would be a nice value-added feature. What I'm not sure about is whether to charge for it. I'd definitely charge for the POD book, since there is a cost to ME to print it; but I'm on the fence about charging for the download. What do you think? It wouldn't be very expensive, more on the order of an ebook than a graphic novel. As I see it, there isn't a "right" and a "wrong" answer here -- I mean, voting for the free option doesn't mean that you don't want me to be compensated for my work or anything of that nature. The thing about Kismet is that I would love to monetize it somehow, and I'm tossing around various options for accomplishing that - I should note that none of these options includes shutting off access to the archives, which will ALWAYS be free online no matter what direction I go. At the moment I'm weighing the benefit of what small profit I might make for a pay-per-download PDF versus the benefit of having the PDF out there and freely available. And the thing about webcomics is that they don't lend themselves to ereaders very well at ALL. I would have no compunctions whatsoever about charging for an ebook version of a novel I'd put online for free, because it is a nice versatile product that people would appreciate and use. 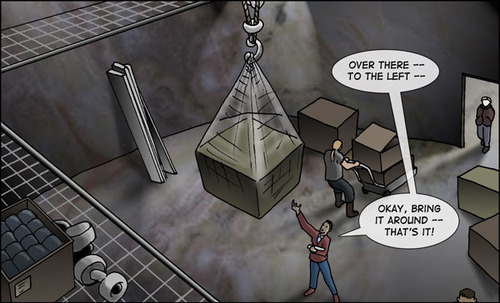 A PDF of a comic, though, is mostly useful in the same venue as reading the comic online: you can read it on your computer, but not much else. And I feel a bit odd about charging for it. Help me name the kid! One character in Kismet who does not yet have a name is the child in this and this page. She is a girl, and I want her to have some sort of plant/tree/nature type of name, but beyond that, I am drawing a blank. On Tertia, due to the lack of last names, it's fairly common for children in the younger generation to be given names that are unique or unusual. So, in addition to common plant/tree/flower names, she could be named after just about ANYTHING. For new readers, it's recommended that you begin at the beginning (we're only on page 16; there isn't much to catch up on!). Sun-Cutter is a sequel/parallel story to Hunter's Moon; it doesn't pick up directly where HM leaves off (actually, the timelines of the two stories are more or less concurrent), but HM provides a lot of backstory for the events that will happen in SC, and some of the HM characters will be appearing later on. Sun-Cutter can also be found on its own page at WebcomicsNation, where you may find it more comfortable to follow than on LJ/DW. There is an LJ feed for it, kismet_feed, that someone kindly set up for me a long time ago. I will attempt to get a Dreamwidth feed up and running at some point, though I haven't done that before, so it may take me a bit to figure out how. And without further ado, on to the comic! Quick note: If you're reading this on LJ, the next/previous page links go to the Dreamwidth versions of the pages. I started out in the beginning trying to code it differently on each site, but quickly realized that this was way more trouble than it was worth! DW is ad-free for non-members, so I thought it would be a more pleasant browsing experience if I had to pick just one (as opposed to LJ, which uses ads on non-member and free journal pages). I apologize if this is inconvenient for anyone; you can also read the archive on WebcomicsNation if that's easier. My series of introductory project posts has to begin with Kismet, because, well, first of all, it's Kismet and I love it, and second, Kismet has not just one but two anniversaries this year. October will be the 10th anniversary of the Hunter's Moon webcomic -- it was 10 years ago, October 2002, when I put up the very first pages. And this year is also the 20th anniversary of Kismet itself. If I remember correctly, it was 1992 when I sketched the very first Kismet characters on an old manilla sketchpad, a husband and wife team of bounty hunters named Dusty and Elaine. Kismet is a sprawling space opera, a series of interwoven comics and short stories taking place over the course of a few decades in the middle of the 28th century. The "present day" is 2752, or 276 in the New Galactic Calendar. Most of the Kismet stories are self-contained (more or less), though as a whole, they build on each other. • Hunter's Moon is a 340-page color graphic novel that I worked on from 2002-2006. It is now complete, and I recommend it as a good starting point for introducing Kismet, its cast, and its main storylines. • Sun-Cutter is the next in the series. There are only fifteen pages right now, but it will be starting up again shortly. • Kismet City Limits is a collection of short comics from the decades leading up to Hunter's Moon. • There is also a comics landing page that lists all the comics in chronological order. Projects? Projects! I have projects! • I'm currently working on the second draft of an urban fantasy novel (two more in the series are already plotted out). I really think I might be able to get an agent to take a look at this one. I'll talk more about it soon, but I'm always kind of weird and superstitious when I'm working on a novel, as if saying anything about it will torpedo my ability to finish it. And I'm very much in "cling to the novel tightly" mode rather than "tell the world about it" mode right now. But soon? • I'm working on Kismet again! The problem is ... er. I'd probably get a lot farther if I could settle down and work on just one Kismet story, but that doesn't seem to be what's happening. So then I went, hmm. Perhaps I need to just shelve the long stories completely for a while, and do some of the shorter Kismet stories which have been rattling around in my brain for years. That way, I can get a good grasp on the characters and character dynamics, since I haven't worked with them in any great depth since I finished HM back in 2006. I started working on Memories of Snow, a story I've had in mind for ages that takes place some 13 years before the present day, with young Frank, Fleetwood and Colette. Now I have a few pages of that finished and ... here we are. *g* I was hoping to get this one done and ready to post in time for Christmas, since it takes place around Christmastime, but I have a lot of things to do between now and then, so I can't promise anything. Early 2012 is probably more realistic. Kismet is a priority right now, though, so between the three projects currently underway, I'm bound and determined to get at least ONE Kismet series up and running in 2012. • I've been involved with Torn World for a few months now - a shared-world fiction & art project spearheaded by ellenmillion. I've contributed some art (not a whole lot) and have been serving on the canon board (copy-editing, canon-editing and approving new stories/art) ... though admittedly I have been slacking somewhat kind of a lot lately, and need to get myself back in gear. Still, there is something really heady about being involved with a group of people all pulling together on a creative project, the same sort of free-floating creative energy that I get from being involved in fandom. And I'm having fun. Mmmm ... and that's pretty much it, I think! How are all of you? I've been really dragging my feet because this is an announcement that I haven't wanted to make ... but I'm going to have to put Sun-Cutter on hiatus for a while. I'm taking a full-time credit load this semester. More importantly (to me! ), there is a local publisher who is definitely interested in publishing Freebird next year, but needs 20-30 pages of new material to bulk out the book enough to make it worth their while, which I've tentatively promised by the end of the year. I had already fallen far enough behind on Sun-Cutter, due to work and travel, that I'd run through my buffer of pages done in advance, and was working week to week anyhow. I didn't have a safety zone, and this is the week that it caught up to me. I'm not going to have a new page on Monday. I was hoping to get through this scene, at least, before I had to stop, but I think this is where it's going to rest for now. Okay, so ... the Sun-Cutter graphic novel deals pretty heavily with the Tertia-Secuba conflict in the Kismetverse. As I'm working on today's page, I realized that I'm going to need some slang that both sides use for each other. The only thing that came up in Hunter's Moon was some of the Secubans calling the Tertians "terties", which is really just my half-assed "damn it, I need a slur here, what can I use in a hurry?" On this page, I need something kinda similar for the Tertians soldiers to use to refer to Secubans they're not fond of, and this got me thinking about my desperate need for fake-offensive but not actually offensive slang in the Kismetverse. So I'll throw it out to you -- do you have any suggestions for slurs that the Tertians and Secubans could use for each other, preferably terms that aren't particularly offensive or politically loaded in our world? - Secuba is a clement, roughly Earth-sized waterworld; Tertia has a climate similar to Venus, though it's bigger with gravity about twice Earth's. - Since the two groups diverged only about 150-100 years ago, there aren't any physical/racial/phenotype differences between them to speak of (as a population, I mean; not as individuals, obviously). Both planets were settled by North Americans and the majority of them are white. - Secubans gain a tattoo on their arm when they reach the age of majority. Tertians seem to have kept the fondness for tattoos (since we've seen that both Signy and Sagan have tattoos) but don't attach any particular cultural significance to them. Sadly, this is how a lot of world-building decisions in Kismet are made. This was the only scene that was supposed to take place here, but really, a planet with dinosaurs is just begging to be explored. I wonder if they're some kind of natively-evolved analogue or a genetic experiment. New ultrasound cuff can stop internal bleeding on the battlefield. I am SO using this idea in Kismet. Of course, they'll probably be so far beyond that in 2752 that it'll be like applying magnets for "internal troubles", but I've conveniently ignored this fact of technological evolution in every other aspect of their technology, so why stop with medicine? :D They could have a handheld version -- a non-invasive clotting gun, basically. Jamie should have one!